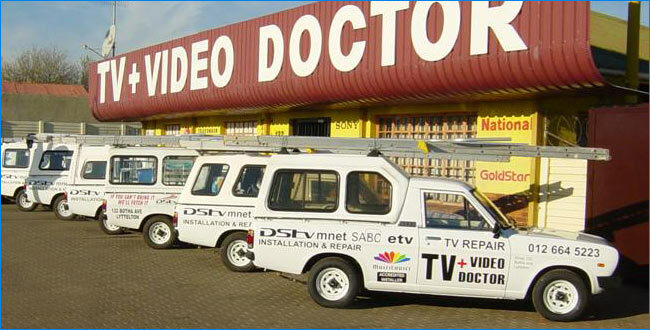 TV+ Video Doctor, situated at 132 Botha Avenue Lyttelton, Centurion, is the largest and most professional TV repair shop and DStv Satellite Dish installation company in Centurion and Pretoria. We employ twenty-two staff which are trained and in possession of electrical engineering or DStv installation certificates. We do on average over 800 successfully completed TV repair and DStv Satellite Dish installation jobs per month. We repair all makes of televisions - Plasma TV, HD LCD/LED TV, 3D, OLED, Rear Projection TV and CRT TVs(the "box TV") as well as repairs to VCR, DVD, Hi-Fi, CD Player, and Prologic amplifiers and offer FREE collection and delivery for Television repairs in the Centurion and Pretoria areas, south of the Magaliesberg. We install SABC, M-Net, E-TV aerials, Starsat satellite dish, DStv satellite dish, home theater and surround sound systems. We also specialize in communal TV aerial and DStv distribution networks for townhouse and guesthouses. This includes new DStv installations (Planning and layout), upgrades, additions and repairs. We are MultiChoice accredited installers, (Reference: MultiChoice National Installation Manager Co van der Raad) and Starsat (previously TopTV) accredited installers (Reference: TopTV (now Starsat) installation manager Basil Claasen) as well as approved contractors to Mutual & Federal (Reference: Procurement Manager Tony Marques). We are also accredited installers of Elsat DStv Satellite and SAMSAT DStv satellite equipment sold in major chain stores. Our DStv Satellite Dish installers are MultiChoice trained. HiFi and TV Repair techicians have done technikon and agent training courses. All staff receive ongoing in-house training and apprenticing which maintains high standards. Our staff are incentivised, and statistics such as "DStv installations booked", "DStv installations successfully completed", "TV repairs delivered", "TV repairs in progress" and "returns under guarantee" are monitored and graphed daily. All Sound system and TV repairs are tested and checked by a quality control inspector before returning to the customer. DStv installations are randomly spot checked. We are up to date on the latest (high definition) HD Television technology and will gladly explain the advantages of MultiChoice HD PVR and MultiChoice Xtra view. DStv decoders and HDMI extra TV points to get the best possible picture form your HD television set. We will be pleased to quote and repair or install any home theatre surround sound system, Television, Plasma TV, Projection TV, LCD Tv, VCR, Hi-Fi, DVD, MultiChoice DStv satellite dish, Starsat satellite dish or TV Aerial you might refer to us in the Centurion, midrand and Pretoria areas. Trust us with your DStv & home theatre system installation & LCD TV repairs - for fast, professional service that is guaranteed for 3 months!